I am so excited to share with you my "Halloween is a Time for Haunting" table decoration today for the 31 Days of Halloween with Stampendous and the Smeared Ink Blog. 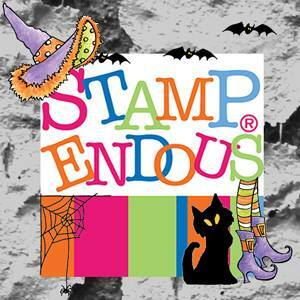 I used 3 of Stampendous fabulous Halloween stamps to create my project. I began by first die cutting a Notebook die cut out of mat board, stamping Stampendous Pumpkin Cat to the front using black ink and applied Dusty Concord Distress Ink using a blending tool. Form box and set to one side until you are ready to put everything together. Stamp Pumpkin Cat Stamp on white paper, color with Copic Markers. Paint spool with Vermilion paint, allow to dry. Stamp Eek A Boo image twice on white paper. Color images with Copic Markers, fussy cut out and place together with pop dots. Add pattern paper strip to dry spool. Stamp Doodle Bat image twice using black ink to white paper. Color with Copic Markers, fussy cut out and adhere together at body. Adhere prepared Notebook box to top of spool using glue gun. Adhere prepared Pumpkin Cat to front. Adhere floral moss to bottom and top of box using glue gun. Adhere prepared Eek a Boo Pumpkin to front of Spool using glue gun. Adhere floral moss around Eek a Boo Pumpkin. Adhere floral moss to top of Notebook Box using glue gun. Adhere prepared Doodle Bat to twisted wire using glue gun. Adhere berries and small leaves randomly to floral moss using glue gun. I am so glad you stopped by and hope you enjoyed my "Halloween is a Time for Haunting" table decoration. Make sure to check out all the 31 Days of Halloween projects that are being shared all month long by the Stampendous Design Team and don't forget to go the to the Smeared Ink Blog for more inspiring projects. Don't forget to check out the Stampendous Store HERE!!!! This is absolutely AMAZING!!! Every little detail that you've carefully selected! OH WOW!!!! Absolutely amazing!!! I love your table decoration!!! It is FABULOUS!!!! This is wonderful! I love it. the doodle bat is now on my want list! OMG!!!! Love this table arrangement. Puts a Halloween smile on my face, Thanks for sharing. Hope I didn't blow your eardrums out when I squealed with delight over this amazing work of art! LOVE every single bit of it!!! So creative and inspirational!!! I want to join you for THanksgiving! TFS! I am also AMAZED by your beautiful creation. when I see those flat pumpkin pieces laying on the table I would not believe they look so plump and squishy on the final project. The color GLOWS! This is so fabulous!! I love your design. What a great centerpiece. A truly spooktacular creation! Love every inch! they each have their own personality. Amazing project, thank you for the inspiration. Awesome! This is just fantastic! What a wonderful creation! Thanks for the glimpse into your process, as well; it's always fun to see the process! WOW .... amazing... tons of detail. Great inspiration! Thanks for sharing!!! Pam, this is just AMAZING! Super job on the elements, coloring and just knocking it out of the ballpark! 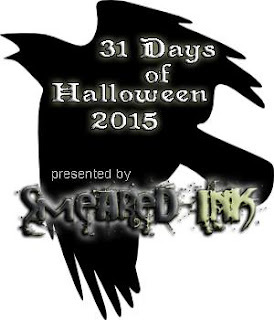 Fantastic job, thank you for sharing in the 31 Days of Halloween Hop!